Q: What’s the difference between selling bikes and selling cars? 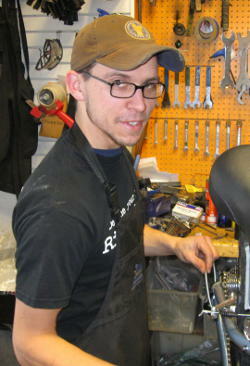 A: At Century Cycles, we don’t work on commission or have quotas. We can truly keep the customer’s best interest in mind to make sure they get the best bike for their needs. It’s a pure selling experience that focuses on good, fun things. Q: Do you remember your first bicycle? A: Oh, yeah. My first bike ties into my first real heartbreak as well. In my recollection, I had a 24” cruiser -- or maybe it was even smaller -- that had “Challenger” on the side and was black and gold. I tried to tweak it myself by adding mag wheels. My mom noticed a bare bike frame in the garage and put it out on the curb with the trash. Gone. Because of that, I keep bikes I like for a long time. Q: So how many bikes do you have right now? A: I have about six that are fully functional. I always have something around for friends to ride so they don’t have an excuse not to ride with me. A: The best recent riding is on a single speed rigid mountain bike. It started as a hardtail Diamondback and is now a Frankenstein bike with a mix of Surly and other parts. A: Dirt. Not a doubt in my mind. It keeps you keen. You have to be vigilant when you push yourself off-road because there is real risk involved. But there are also those distinct moments of zen - you're reacting without really seeing, just focusing on going fast and staying smooth. A: Clean your bike. As mechanics, we see a lot of really dirty bikes. Just keeping your bike clean does wonders for it. A: The variety – every day there are interesting situations and customers. Q: When did you start bicycling? A: I got my first “real” bike when I lived in Chicago about six years ago. It was a steel frame mountain bike to attack the streets of Chicago. I took a brief hiatus when I moved to Pittsburgh – the bicycle commuting was painful with all those hills – but started back up again when I moved back to Cleveland. Q: What’s your favorite trail? A: I’m still discovering a lot. I really enjoyed a fast trail called Pontiac Lake in Michigan. With its sweeping banked curves and the effortless speed you sustain, it feels like you're in a dirt bobsled track. Q: What do you like to do when you’re not on a bike or at work? A: I play music. Besides bicycling, my other outlet is acoustic guitar. Q: What’s your favorite post-ride drink? A: Chocolate milk. It does the body good!